Suitable for a variety of low-slope commercial roofing applications, Firestone UltraPly™ TPO roofing membrane is a sustainable roofing solution for a wide range of building types. UltraPly TPO membrane also offers design options with panels available in reflective white, tan or gray, which can help reduce a building's cooling requirements. White and tan UltraPly TPO membranes meet the new version of the California Energy Efficiency Standards for Residential and Nonresidential Buildings (Title 24). These standards define cool roofs in California to have a minimum three year aged reflectance of 0.55 and a minimum thermal emittance of 0.75 for low-sloped non-residential buildings. White and tan UltraPly TPO membranes are listed with the Cool Roof Rating Council (CRRC), and meet or exceed the new Title 24 requirements for low-slope roofing membranes. The listing for white and tan UltraPly TPO membranes can be found on the Cool Roof Rating Council (CRRC) web site. Firestone UltraPly™ Platinum TPO system is a thermoplastic roofing system backed by a 30 year warranty. Comprised of a durable, 80 mil thick scrim-reinforced membrane, the UltraPly Platinum TPO system can be fully adhered or mechanically attached to Firestone insulation and fastened to a wide range of deck substrates. The UltraPly Platinum TPO system features Firestone patented Wide Weld technology to provide the industry's widest field seams and highest mechanically attached wind ratings, while its scrim-reinforced membrane offers enhanced puncture, tear and abrasion resistance. 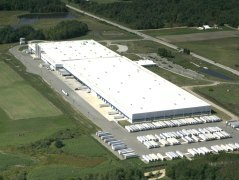 The reflective surface of the UltraPly Platinum TPO system meets ENERGY STAR® standards for energy savings in warm climates, making it an exceptional long-term roofing value for building owners. Firestone UltraPly™ TPO XR combines the durability of a single-ply membrane with an external backing of eight-ounce, non-woven polyester to offer an additional internal and external reinforcement for remarkable puncture resistance. Installation flexibility enables the roofing system to be installed with either hot asphalt, Firestone UltraPly TPO XR Bonding Adhesive or foam adhesive XR Stick or ISO Spray S.
Available in white, tan or gray and in thicknesses of 45, 60 and 80 mil, UltraPly TPO XR provides excellent weatherability and strong resistance to UV rays and common rooftop chemicals. The XR Stick Adhesive is a two-part polyurethane adhesive can be used over many existing substrates, adhering UltraPly TPO XR for both new and re-roof applications. Firestone Building Products UltraPly™ TPO SA with the NEW Secure Bond™ Technology is a self-adhering membrane with a revolutionary, factory applied, pressure sensitive adhesive. Designed to be the next generation, in fully adhered roof system application, Firestone's Secure Bond Technology ensures uniform adhesion coverage across the entire membrane, creating the most powerful bond possible. This advanced technology significantly improves installation speed over traditional TPO fully adhered systems and widens the weather window, with the ability to install down to 20°F. Call Bella Vista General Contractor today for a free estimate on Firestone TPO Roofing Systems.